Corporations and governments are just learning the benefits of green energy. The advantages of alternative energy sources are growing every day. We are excited about the challenges given to us by the water and power leaders. They demand high quality that can withstand a rigorous environment. Our expertise and experience in a variety of industries gives us a solid basis for innovation. Our professional pipefitters are certified to weld stainless pipe to ASME standards under TSSA. 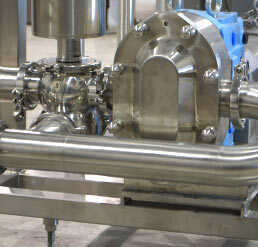 This positions Advanced Stainless as a preferred choice when it comes to building skidded process systems. We are able to build in our own factory or right at your site. Our professional team is also trained and certified in orbital welding. Partnerships increase our capacity. We are able to provide 4 AMI welding machines with experienced operators, to accommodate large process piping projects. The demand to create these green processes funnels to process equipment suppliers is growing. Our expertise in food and beverage sectors gives us the experience we need to offer storage tanks and pressure vessels, skidded process systems and custom fabricated components to water and power industries.